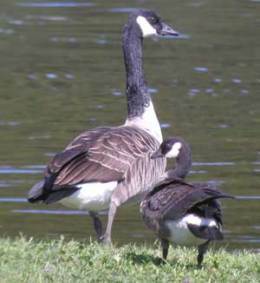 Canada Goose-looking birds come in widely different sizes and ornithologists, who love obsessing about taxonomy, have a lot of fun with the subject. The subject comes up because we shot quite a few Cacklers in Canada in October, which were probably what we used to call Hutchins' or Richardsons' Goose. These birds�are high-Arctic breeders, and only winter on the East coast as rare vagrants. Bird Dog says he has seen them occasionally on the East coast. Their CLO link here. For the part of the�Wikipedia entry which reviews all of the taxonomy, see continuation page below. The Cackling Goose was originally considered to be the same species or a subspecies of the Canada Goose, but in July 2004 the American Ornithologists' Union's Committee on Classification and Nomenclature split the two into two species, making Cackling Goose into a full species with the scientific name Branta hutchinsii. The British Ornithologists Union followed suit in June 2005.